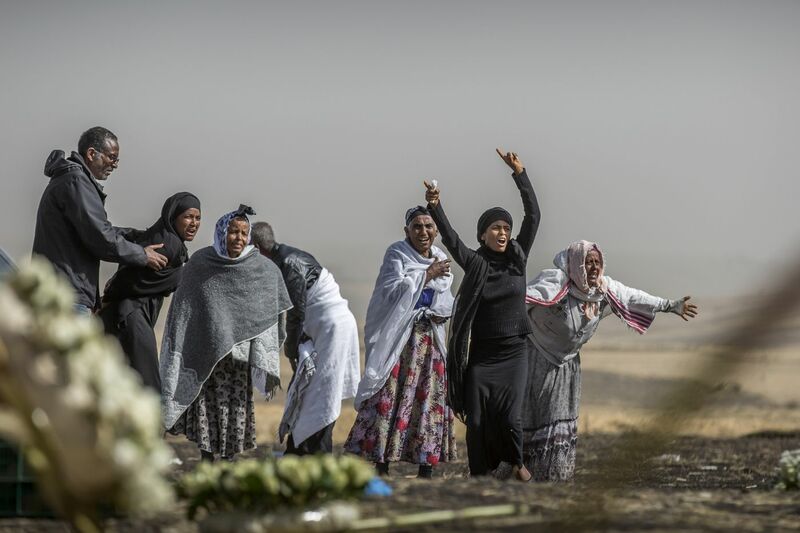 Ethiopian relatives of crash victims grieve at the site where the Ethiopian Airlines Boeing 737 Max 8 crashed shortly after takeoff on Sunday killing all 157 on board, near Bishoftu, south-east of Addis Ababa, in Ethiopia, on Thursday, March 14, 2019. ADDIS ABABA, Ethiopia - A new piece of evidence found by investigators on the ground here suggests the Ethiopian Airlines flight that crashed Sunday may have had a problem with a new flight-control system also suspected in the crash of a Lion Air flight in October. It is the second piece of information suggesting similarities between the two crashes involving Boeing 737 Max 8 jets. Investigators found a device known as a jackscrew in the wreckage. The jackscrew, used to set the trim that raises and lowers the plane's nose, indicates the jet was configured to dive, according to John Cox, a former pilot and an airline-safety consultant with the Washington-based aviation-safety consulting firm Safety Operating Systems. Cox, formerly the top safety official for the Air Line Pilots Association, said he was privately briefed on the evidence Thursday by people familiar with the investigation. "All we can say definitely is that the trim was in a position similar to the position found on the Lion Air airplane and it would cause the nose to go down," he said. "This will be consistent with a nose-down flight path, which they think is likely with the Ethiopian airplane. "It points to one central link," Cox said. "We need the data from the flight data recorders. We need it as quickly as possible. . . . The faster that we get that information, it will let everyone know what needs to be done. We don't know in fact if these accidents are related. There are some similarities." Daniel Elwell, acting administrator of the Federal Aviation Administration, cited newly refined satellite tracking data and evidence recovered from the wreckage site as factors in his decision to ground the jets Wednesday. That data also showed similarities to the Lion Air flight. Cox said he believes the jackscrew is the new evidence Elwell was citing. Meanwhile, French aviation experts began work Friday on the plane's heavily damaged data and voice recorders. Officials with France's Bureau d'Enquêtes et d'Analyses, which has extensive experience analyzing crashes in Europe, said that work to retrieve information from the flight data recorder of the Boeing 737 Max 8 has begun in coordination with the Ethiopian investigation team. President Trump spoke by telephone with Ethiopian Prime Minister Abiy Ahmed on Friday to again express his condolences and underscore the United States' commitment to work with Ethiopian and international civil aviation authorities on the investigation. Eight Americans were among the 157 killed in the crash. The focus now, however, is on the two "black boxes" that arrived in France on Thursday. Germany had earlier turned down the opportunity to examine the recorders. The data extracted from the recorders will be used to reconstruct the six-minute flight before the plane crashed in a farm field about 40 miles from Addis Ababa, killing all 157 passengers and crew members. That data includes the voice communication of the pilots and the readings of the various sensors. Officials from the U.S. National Transportation Safety Board (NTSB), which sent three investigators, the FAA, the European Union Aviation Safety Agency and Boeing also are assisting in the probe. Experts say it typically takes almost a month to provide a comprehensive analysis of the data in the recorders, but at least some early information could be available within 24 to 48 hours. Former NTSB chairman Christopher Hart, who also is a pilot, said the jackscrew, combined with data gathered from the plane's black box, could give investigators a sense of the plane's flying position before the crash. "By knowing the stabilizer and elevator position they know what kind of forces the plane was experiencing in the moment," he said. In a preliminary investigation, the crash of a Lion Air Max 8 plane into the Java Sea on Oct. 29 was attributed to a faulty sensor causing an automated system to push the nose of the plane down. The possibility that the same scenario occurred in Ethiopia has prompted precautionary groundings of the plane all over the world. In all, more than 300 people have died in the two crashes involving the Max 8 jet. Preliminary flight data showed the Ethiopian Airlines plane in trouble almost immediately and struggling to gain altitude in the high thin air above the Addis Ababa airport. The plane descended and then sharply ascended, while moving at speeds far in excess of normal. Within minutes the pilot radioed the control tower reporting "flight control" problems and was given clearance to return. In a description of the exchange reported by the New York Times, Capt. Yared Getachew sounded panicked as he requested permission to return to the airport, shortly before losing contact. Even amid the worldwide grounding of more than 370 of its 737 Max jets, officials at Boeing continued to maintain the planes are safe to fly. The Chicago-based aviation giant has stopped delivery of the planes, a spokesman said Thursday, but their production continues. In the case of the Lion Air crash in Indonesia, faulty information from the angle-of-attack sensor convinced the automated system that the plane was going to stall and pushed its nose down while the pilots wrestled to pull the aircraft up. The result was an erratic flight path in which the plane descended and ascended repeatedly before plunging into the Java Sea, killing all 189 passengers and crew aboard. The data from the recorders in Ethiopia could help determine whether the potential links between the two crashes are real and related to this automated feature on the craft - hundreds of which were flown around the world until China decided to ground them Monday and other countries followed suit. The recorders are required on all flights - all over the world - and are built to withstand fire, heavy impact and intense water pressure. The Ethiopian Airlines devices were discovered soon after the crash, leading some U.S. officials to hope the insights they contain will quickly help determine more about what caused the jet to crash shortly after it left Addis Ababa bound for Nairobi. While Ethiopian investigators have the ability to download information from black boxes, they lacked the tools to do so in this case, given the extensive damage, according to the FAA. Experts were not surprised the Ethiopians opted to send the flight recorders to France rather than the United States, saying such a move was not unprecedented. "Many times foreign countries just have a good relation with a certain other country," said Jeff Guzzetti, a former NTSB investigator and FAA safety manager. "It is closer to fly the recorders to Europe than it is to the United States. From a technical standpoint, the United States would have been the best place to have it because all your technical experts are in the United States. But in past investigations, foreign countries would not opt to send to the U.S., because they were the ones who built the airplane"
Lazo and Aratani reported from Washington. The Washington Post’s Faiz Siddiqui in Washington contributed to this report.